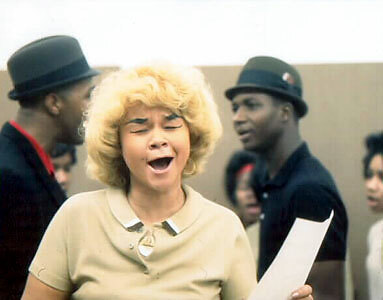 Los Angeles born Blues / Rhythm & Blues / Soul singer, Etta James, regarded as one of the great American vocalists, died yesterday, aged 73. 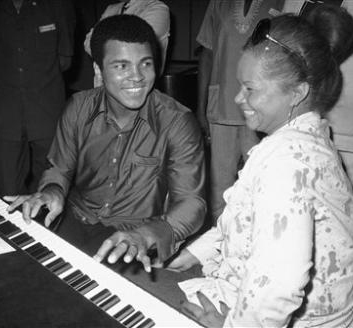 Neither of her 2 most celebrated recordings, ‘At Last’ (1960) and ‘I’d Rather Go Blind’ (1968) were British hits, and, although I was a big Soul music fan at an early age, devouring the singles my older brother and sister had bought, there was nothing by Etta James, so this wasn’t a name I became aware of until later down the line. I knew ‘I’d Rather Go Blind’, as this was a Top 20 hit for a British band called Chicken Shack in 1969 (with vocal by Christine McVie, then Christine Perfect, later of Fleetwood Mac fame), but I hadn’t realised it was a cover version. ‘At Last’, a song that was introduced by the Glenn Miller Orchestra, with featured vocalists Ray Eberle and Lynn Bari, in the 1942 musical, ‘Orchestra Wives’ (a movie which, I should add, features a remarkable Nicholas Brothers dance sequence here), is, of course, acclaimed as an American standard, with James’s version acknowledged as the definitive one. Her one and only British hit, ‘I Just Want To Make Love To You’ reached #5, but not until 36 years after she’d first recorded it. Originally released by Muddy Waters in 1954 (written by Willie Dixon), the track was probably best known in this country via the Rolling Stone’s more upbeat cover, which was included on their 1964 self-titled debut album, James’s version of the song was revived as the soundtrack to a popular Diet Coke advert in the mid-’90s, resulting in her long overdue 1996 chart debut. All 3 of these track were recorded for the classic Chicago label, Chess, which had enjoyed its greatest success in the ’50s, via artists including Muddy Waters and fellow Blues legend Howlin’ Wolf, the Rock & Roll giant Chuck Berry, and Bo Diddley, whose style neatly bridged the two. The 2008 biopic ‘Cadillac Records’ was about Chess, with Beyonce Knowles playing the part of Etta James. It’s ironic that, just as she died, her vocals from the 1962 song, ‘Something’s Got A Hold On Me’, are reaching a new generation and can be heard in clubs up and down the country, having been sampled on recent hits by Avicii (‘Levels’) and Flo Rida (‘Good Feeling’).